40/92 David Mumpower James Garner and Rachel McAdams make a mediocre film tolerable. 65/126 Kim Hollis Personally devastating due to real-life circumstances, but a solid weeper. Nicholas Sparks sure has made a name for himself. Who is Nicholas Sparks, you say? Well, he wrote the novels that became the movies Message in a Bottle, A Walk to Remember, and this one are based on. An impressive cast has also been brought together for this effort, including veteran stars such as James Garner and Gena Rowlands along with up-and-comers Rachel McAdams and Ryan Gosling. Our story follows a retired salesman (Garner) who regularly visits an elderly woman (Rowlands), who is suffering from Alzheimer’s disease. 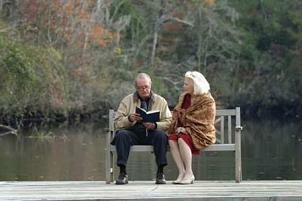 She is alone at a nursing home and he goes in regularly to read to her from a notebook that she keeps on her shelf. The story this man is reading is shown to us in flashback form. This faded and worn notebook tells the story of two young men (Gosling and Kevin Connolly), who were both courting the same girl (Rachel McAdams) in North Carolina during World War II. The war tears them apart and the woman and one of the men are reunited after 14 years, when their lives take them in different directions. As the reading of the notebook continues, it soon becomes clear that this man is one of the suitors and the patient is the young woman he was courting those many years ago.